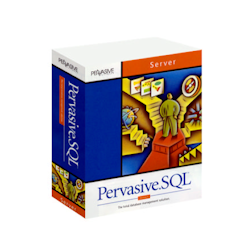 The Pervasive.SQL 7 Server Engine marries the speed of Btrieve with the relational access of the Scalable SQL engine. It is supported on either Novell NetWare or Windows NT/2000 Servers and Workstations. These licenses are valid for either Windows or NetWare servers, and you can stack the licenses to make higher user counts. The original Pervasive part number for the 50-User engine is 90-150674-03. This license can be used to add 50 users to an existing engine, also. The original Pervasive part number for the 100-User engine is 90-160875-1-03 (NetWare) and 90-160675-1-03 (Windows). This license can be used to add 100 users to an existing PSQL7 engine, also.